Paul Simon: Live at Webster Hall, New York premiered December 2011. Experience an evening with Paul Simon. In June 2011, Paul Simon and his eight-piece band filled the stage at Webster Hall, the historic New York City club. 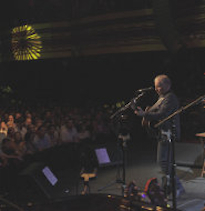 The packed house — the club holds only 1,400 people — witnessed an intimate and highly-charged concert that spanned songs from Paul Simon's more than 50-year musical career. The show was the culmination of a sold out two-month U.S. tour of theaters and small clubs, a rare and spectacularly up-close event for fans of the iconic singer-songwriter. Paul Simon is backed by a band of multi-talented, virtuoso musicians, many of whom have played with him since "Graceland," which won the 1986 Grammy forAlbum of the Year. The evening's repertoire ranged from Simon's years with Art Garfunkel ("Sound of Silence") through his solo career that produced such classics as "Kodachrome," "Slip Slidin' Away," "Boy in the Bubble," "Diamonds on the Souls of Her Shoes," "Obvious Child," "Still Crazy after All These Years" and "Late in the Evening." The legendary artist's set at the East Village venue also featured selections from his most current and much lauded album, "So Beautiful or So What," considered his best work since "Graceland" and "Rhythm of the Saints." The propulsive title song, "So Beautiful or So What," the emotionally-charged ballads "Questions for the Angels" and "Dazzling Blue," and the wry hit "Afterlife," bring this career retrospective to a powerful and contemporary immediacy. Paul Simon: Live at Webster Hall, New York allows television audiences to experience the concert by the meticulous craftsman and consummate performer from a very unique and personal setting. This listing consists of Simon's 11 solo studio albums of original music, from 1965 through 2011. Paul Simon: Live at Webster Hall, New York was produced by Concord Music Group. Own this CD & DVD combo of Paul Simon's 2011 album that features 10 tracks of original songs, along with a few of his music videos.